Several years ago, Christianity Today published a series of articles entitled, 'How It All Began: Why Can't Evangelical Scientists Agree? '1 It is a shame that Christians are divided on the issue of origins. Let me suggest a reason why they are. I was a theistic evolutionist during my college and medical school training. After going through a time when even looking at scientific creationist literature made me feel ill, I began to consider the evidence. What I saw astounded me. I had never been told that there is design in life that cannot be accounted for by chance. After years of further study, I have also been convinced that although there are some problem areas for the young-earth position, the total scientific case for it is much stronger than that for an old earth. Because of all this, it is very unlikely that an outspoken creationist could get through the system intact. Christians often take on 'protective colouration' by accepting scientific orthodoxy but adding a Christian footnote to it. This is no threat to their peers because it fits the prevailing cultural idea that something can be 'true for you, but not for me'. While we may have respect for scientists generally, both believers and unbelievers, it is healthy to recognize the human tendency for covering ulterior motives. If reporters used the same suspicious nature in their reporting of science news that they usually reserve for politicians with whom they disagree, we would have Pulitzer Prizes for an exposé of 'Evolutiongate'. I have had discussions with people who could run intellectual circles around me, and yet I have seen them become infantile when logic led to an uncomfortable conclusion. This is an important issue. It is at the root of the conflict between our culture and the Gospel. Our age does not believe there is objective reality behind religious pronouncements. Yet the evidence for a young earth and recent creation marks the Bible as credible and universally applicable. However, many Christians fear that the Gospel will be discredited if it is tied to literal acceptance of Genesis. In fact, it does not need to be 'protected' from science any more than it needed to be protected from history in the time of Swiss theologian Karl Barth, who stated that even if there was no historical Jesus, the Gospel was valid. The Jesus whose existence could not be confirmed soon became equivalent to a Jesus who did not exist, and Barth's theological grandchildren later proclaimed that God was dead. The Christian faith is not a leap in the dark, but rests on solid evidence and calls for a commitment to the true and living God. This requires distinguishing truth from error. God makes His existence clear and accredits His Word. He then holds people accountable for response to the light they have been given. God's revelation can stand the test of scrutiny. Some say the biblical data allow for an old earth, therefore an old earth should be the preferred position. However, this ignores the problem of the alleged long ages of death and suffering (allegedly represented by the fossil layers) before man. I think it would be safe to say that if it were agreed by secular science that the earth is young, there would be absolutely no problem harmonizing that with the Bible. Some have expressed concern that there was not enough time in a 24-hour sixth day of creation for Adam to name all the animals. This worry diminishes when one recognizes the nature of Genesis 'kinds'. There was tremendous potential for variability built into the original living creatures that allowed a relatively smaller number of 'kinds' to branch out into the plethora of life we see today. It does not allow macro-evolution (the alleged evolution of one major type of creature into a very different type), because there are limits. Also, Adam's brain at that time had not been subject to the decay that has come over time because of sin, so his thought processes would have been much better than ours. There are warm-hearted, clear-headed Christians with scientific credentials who will disagree with me on these points. Many of them are far more spiritual than I am. But how ever much they may have contributed to God's Kingdom, theistic evolutionists and even long-age creationists are wrong on this one major point, as I see it. Their compromise of truth is probably understandable to many, and I cannot say that in similar circumstances I would have done any better. Still, it must be seen for what it is. They have uncritically accepted the intellectual milieu of their peers. In the process, they have been forced to mistrust the Bible. The effects may not be immediately apparent, but the danger lies down the road. And for a significant number, it has already led to the rejection of other vital biblical doctrines. A scientist who is a Christian needs to consider whatever conclusions the evidence seems to justify. However, conclusions depend powerfully upon presuppositions. Beginning with the rock of the Scriptures as the foundation of his thinking, with all their credentials, he may become aware that some of the conclusions of the scientific establishment are questionable. He should not disregard the evidence. Rather, he must critically examine it and look for those suppressed truths that Paul writes about. This should be done regardless of potential disapproval by the scientific community. 'How It All Began: Why Can't Evangelical Scientists Agree? 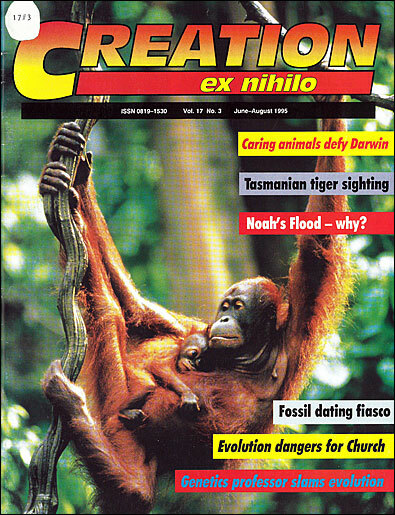 ', Christianity Today, August 12, 1988. Jerry Bergman, The Criterion: Religious Discrimination in America, Onesimus, Richfield (Minnesota), 1984. Robert V. Gentry, Creation's Tiny Mystery, Earth Science Associates, Knoxville, 1986.